A localization wire literally is a thin wire inserted into the breast through a needle to help mark the location of a tumor or benign mass on the day of surgery. For the patient, it’s one more step in an already painful and emotionally agonizing process. For a group of University of Wisconsin-Madison engineers and clinicians, it was an opportunity to develop a solution that is technologically elegant, precise and patient-centric. 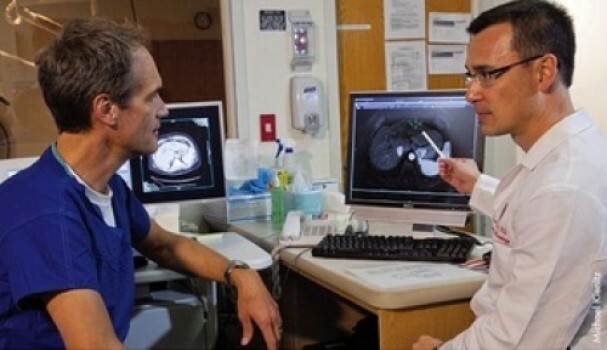 The team’s solution — a system that replaces the localization wire with a radio-frequency tag that helps the surgeon track the tumor’s location with greater precision — was the impetus for the researchers to found the company Elucent Medical. The company’s proposal, which aims to benefit patients and care providers alike, recently won the 2014 Wisconsin Governor’s Business Plan Competition. And to an engineer’s eye, the localization wire creates all kinds of obstacles to the end goals of removing a tumor while preserving as much healthy breast tissue as possible. For example, the wire is inserted when the breast is compressed in a mammogram machine or under ultrasound guidance. If the mass or cancer is in the center of the breast, there may be a distance of more than two inches from that mass to the skin where the wire must exit.